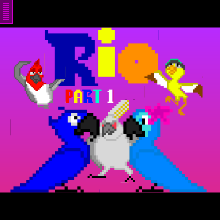 The somewhat long-awaited RIO game is now completed... well, part 1 anyway. Part 2 will come later. --------------------------------CONTROLS------------------------------- Solo Levels - W,A,D Keys or Arrow Keys. Co-Op Levels - Blu = Arrow Keys, Jewel = W,A,D Keys. SPECIAL ABILITIES: Blu = Open Doors, Activate Switches, Double-Jump. Jewel = High Jump, Activates Some Switches.